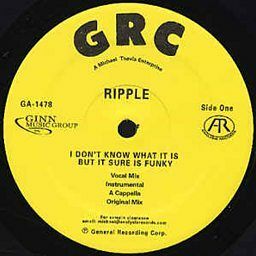 Ripple was an American funk band from Michigan. The group was signed to GRC Records and Salsoul Records in the 1970s, and scored several hit singles, the biggest of which were "I Don't Know What It Is, But It Sure Is Funky" and "The Beat Goes On And On," the latter on Salsoul Records, joined by the Salsoul Orchestra. After moving to Atlanta, Georgia, Wally, Kenny, and Brian restructured the group, adding Victor Burks (keyboards) and Barry Lee (guitar). The group toured extensively around the Southeast, the highlight of which was opening for George Clinton and Parliament Funkadelic on their "Mothership Connection" tour. Wally, Kenny, Brian, Victor, and Barry went on to record their seminal album, "Sons of the Gods". "The Beat Goes On And On", from that album, became a disco/hustle classic that's still being played today. The former's signature "oh-la oh-la ay" line was later incorporated into Marcia Griffiths' smash hit, "Electric Boogie (Electric Slide)."